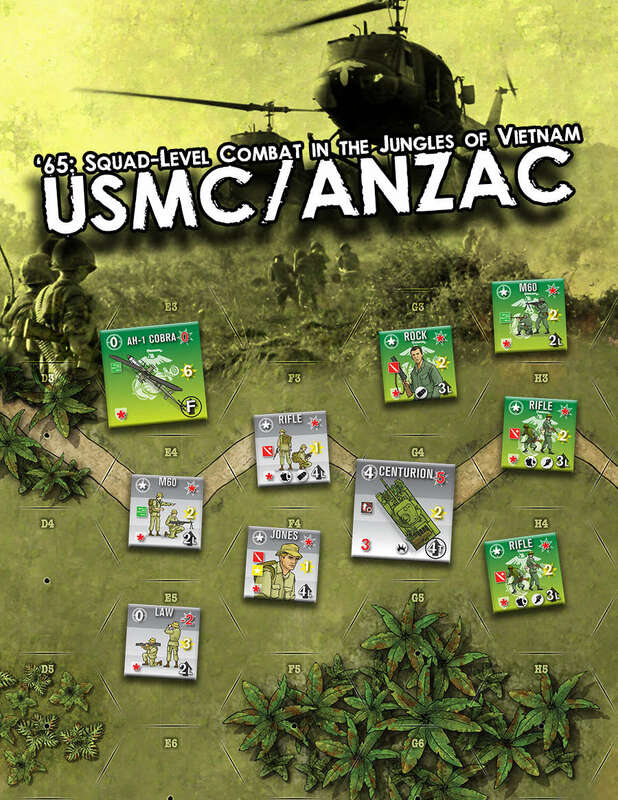 This expansion to '65 Squad Level Combat in the Jungles of Vietnam includes two PDF files (approximately 8.5” x 11”) of United States Marines and ANZAC counters, including rifle squads, heroes, and armored fighting vehicles, such as the Ontos, Centurion, and six scenarios featuring them (three each Marines and ANZACs). The most potent squads in the game, the Marines bring devastating firepower, and heroes with iron discipline to the gaming table. The forces from Australia and New Zealand played a significant role in Vietnam. We’ll let you recreate that role with these ANZAC counters and scenarios featuring their contributions. Centurion tanks, FN-FAL rifles, snipers, and heroes with unique special abilities will all make muster on your gaming table, and provide unique insight into their fight in Vietnam as well as a bucket of tactical-gaming fun. Includes 2 x PDF counter files, full-color scenario and rule files. Video below is an example of the base game, '65 Squad Level Combat in the Jungles of Vietnam.